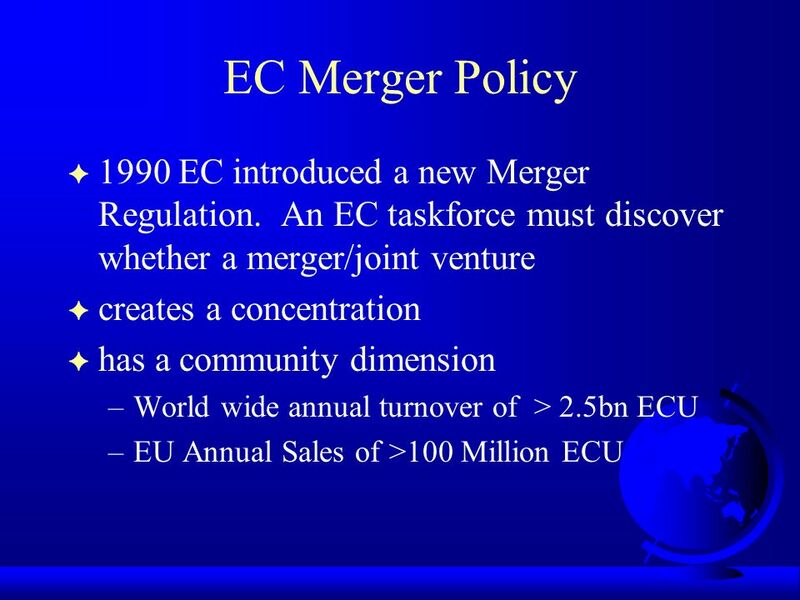 Mergers and EC Merger Policy By Kevin Hinde. 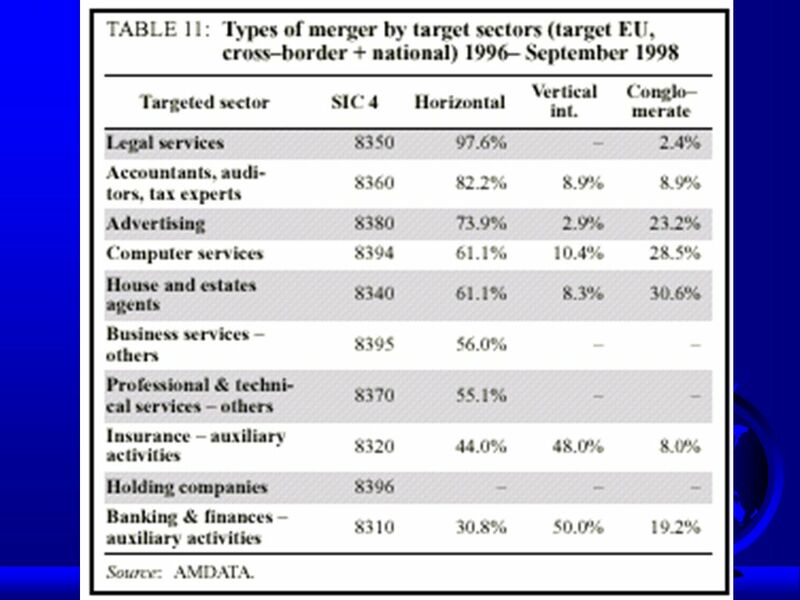 Aims –To explore the rationale for and impact of mergers in Europe. –To demonstrate the role of regulators. 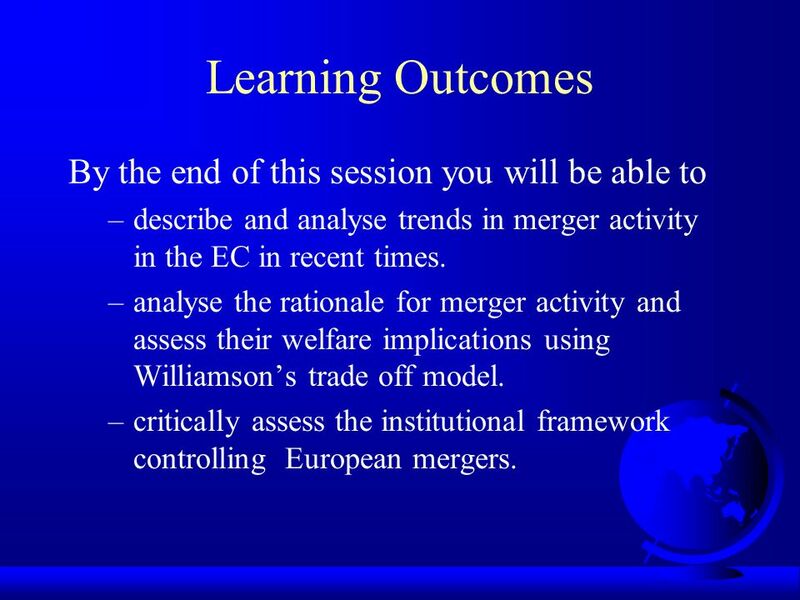 3 Learning Outcomes By the end of this session you will be able to –describe and analyse trends in merger activity in the EC in recent times. 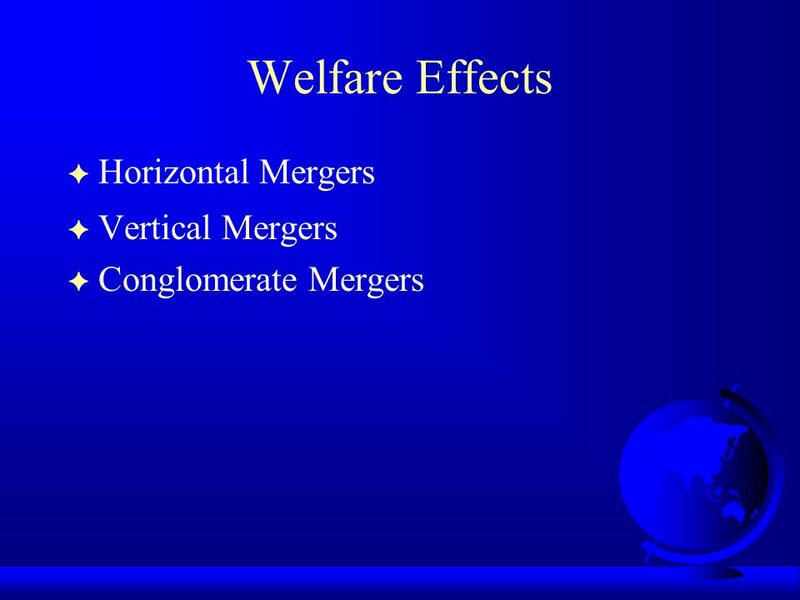 –analyse the rationale for merger activity and assess their welfare implications using Williamsons trade off model. 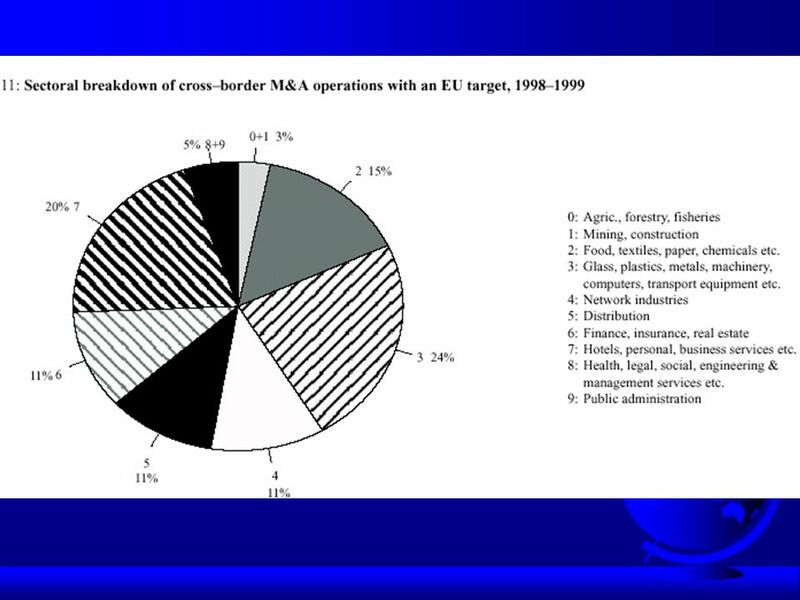 –critically assess the institutional framework controlling European mergers. 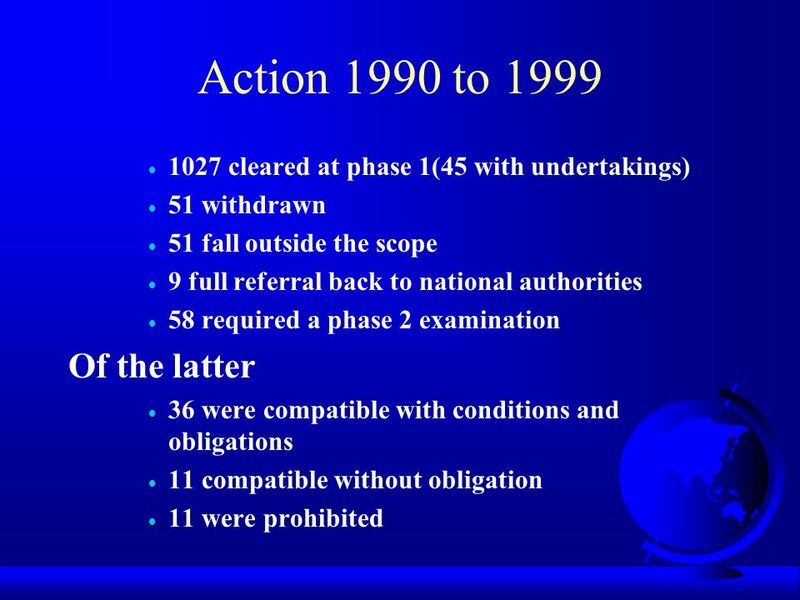 17 Procedures F No concentration may be put into effect before notification or within 3 weeks following notification. 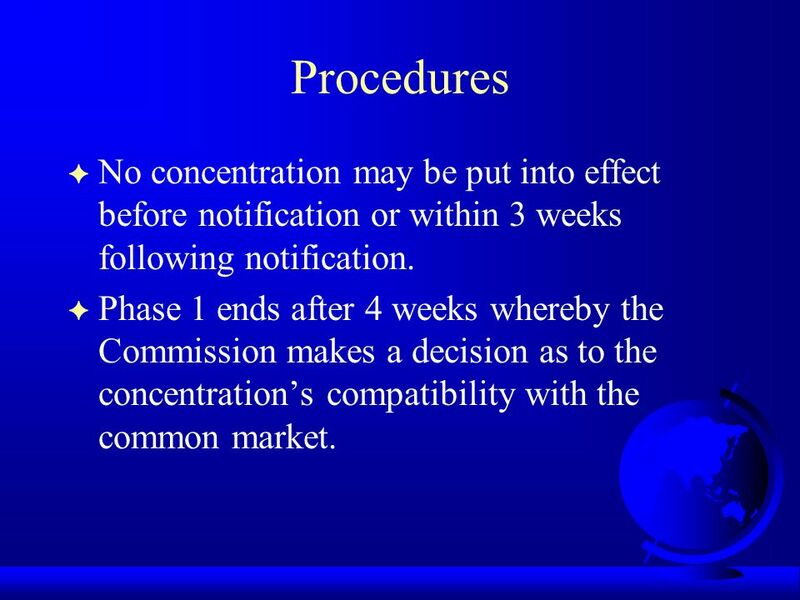 F Phase 1 ends after 4 weeks whereby the Commission makes a decision as to the concentrations compatibility with the common market. 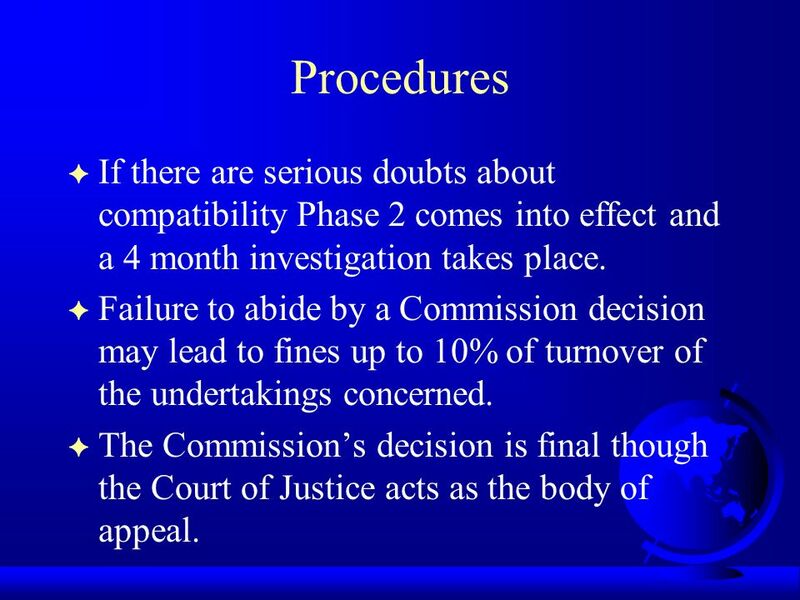 18 Procedures F If there are serious doubts about compatibility Phase 2 comes into effect and a 4 month investigation takes place. F Failure to abide by a Commission decision may lead to fines up to 10% of turnover of the undertakings concerned. F The Commissions decision is final though the Court of Justice acts as the body of appeal. 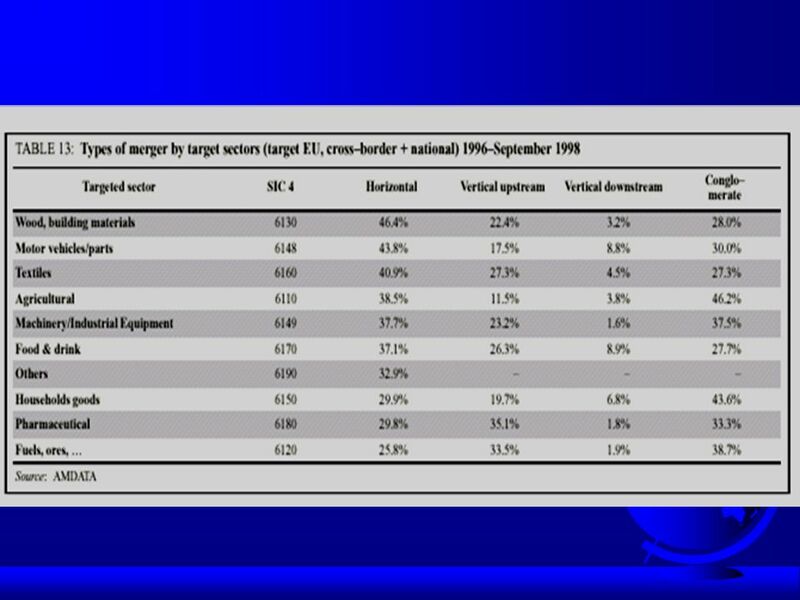 23 Issues F Only large mergers being caught. 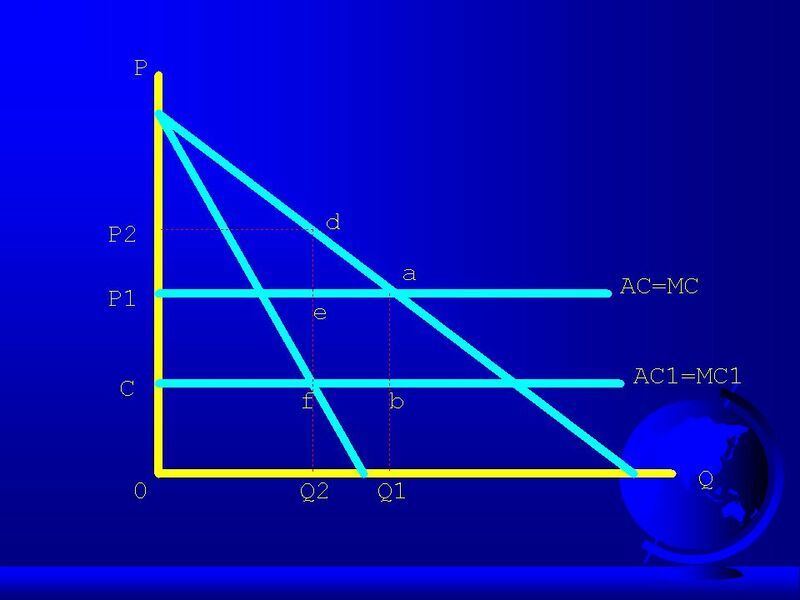 –Threshold levels still considered high –Dominance may persist in smaller industries. 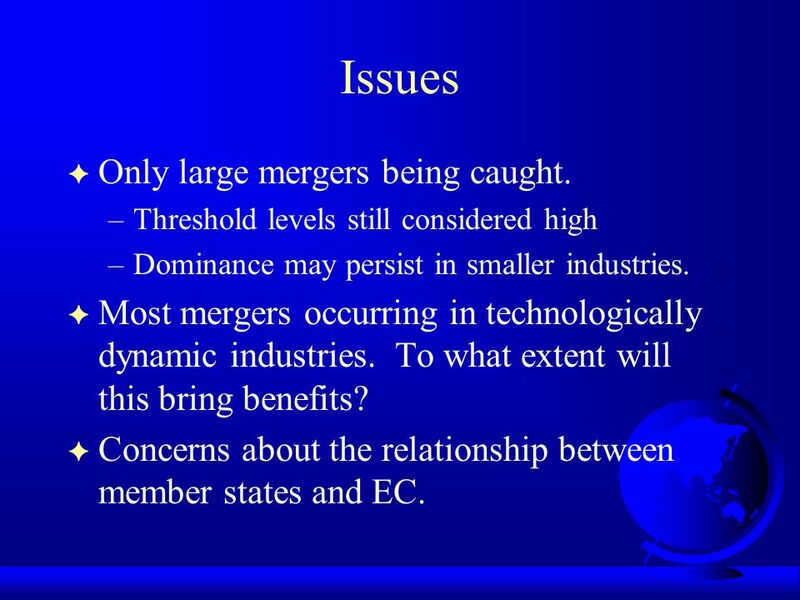 F Most mergers occurring in technologically dynamic industries. To what extent will this bring benefits? 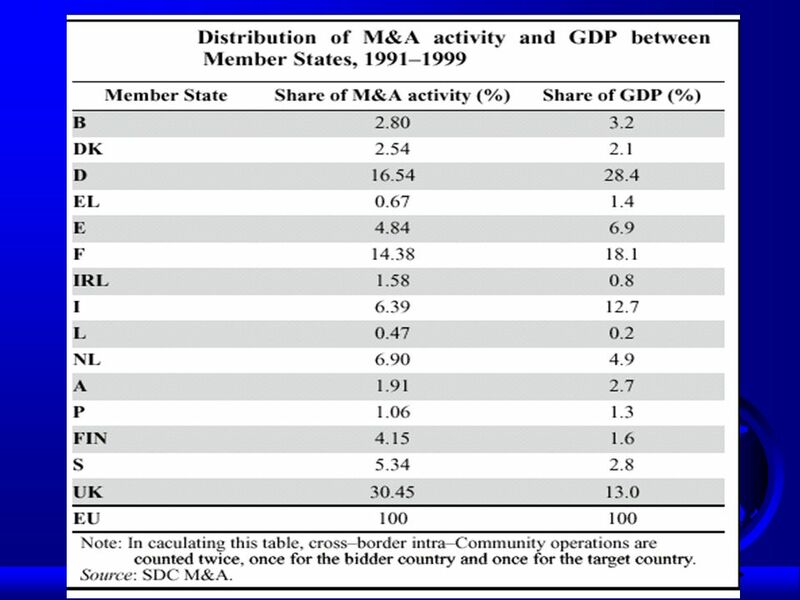 F Concerns about the relationship between member states and EC. 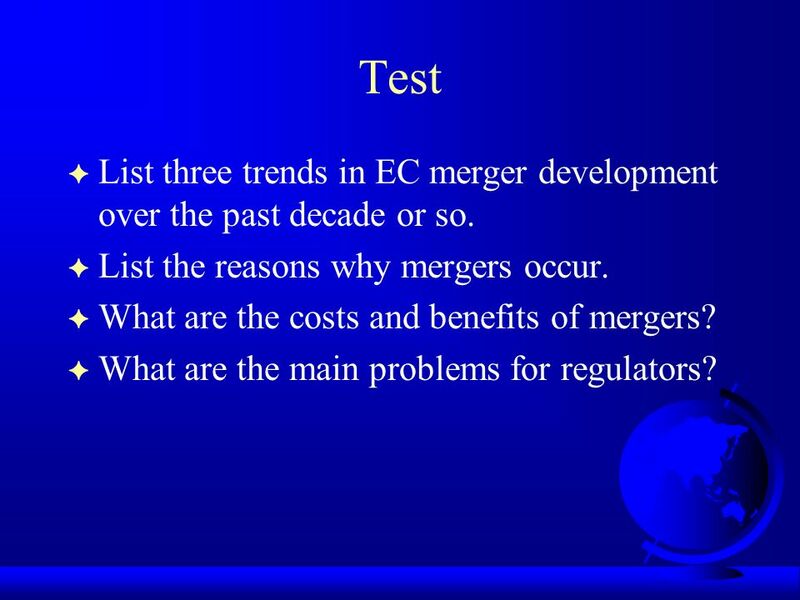 24 Test F List three trends in EC merger development over the past decade or so. 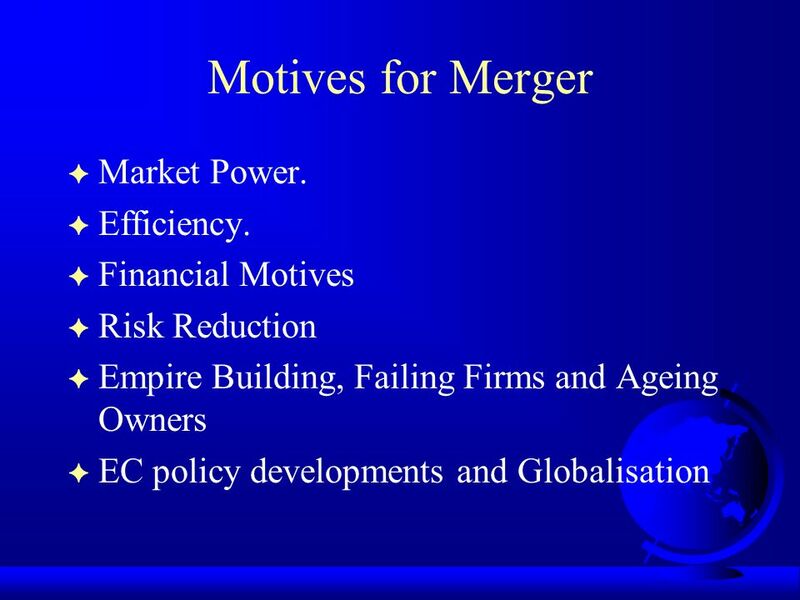 F List the reasons why mergers occur. 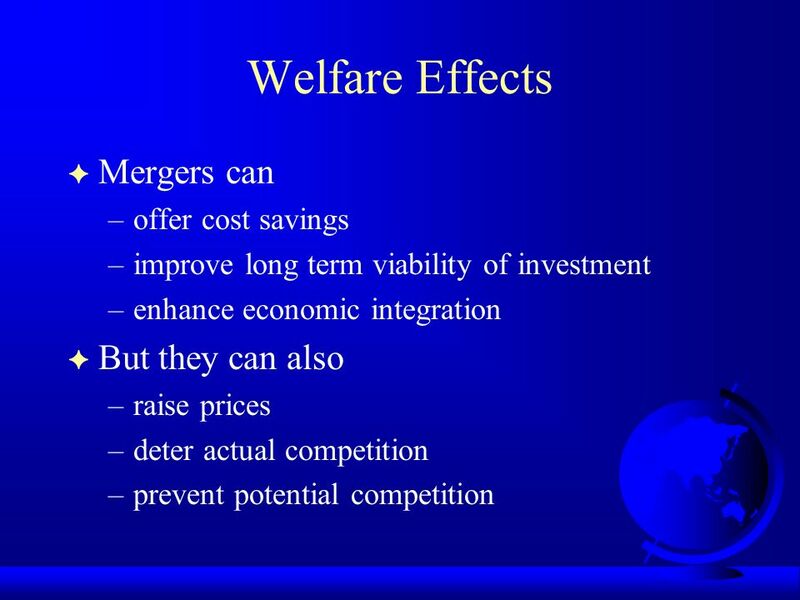 F What are the costs and benefits of mergers? F What are the main problems for regulators? 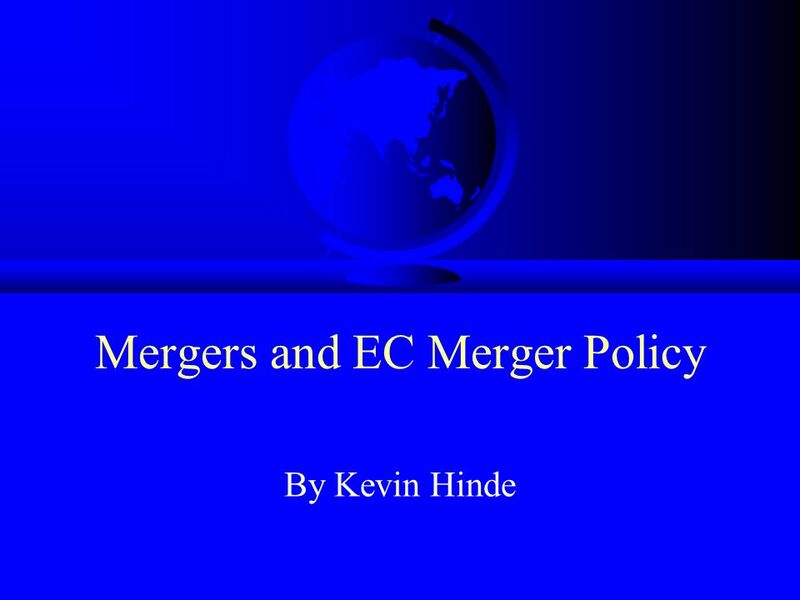 Download ppt "Mergers and EC Merger Policy By Kevin Hinde. 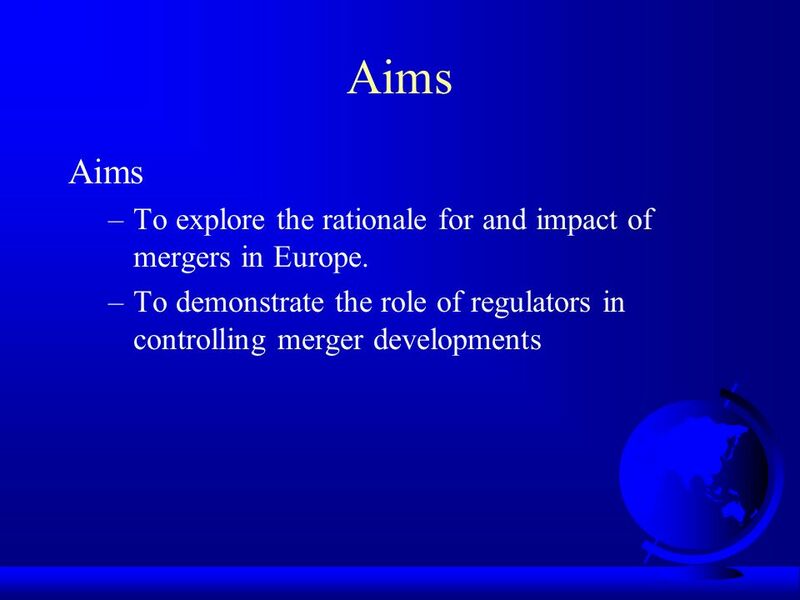 Aims –To explore the rationale for and impact of mergers in Europe. –To demonstrate the role of regulators." Banque de France – Secrétariat général de la Commission bancaire Bruxelles, 19 mars 2010 Early intervention – which new tools for supervisors? Banque de. Gender Perspectives in Introduction to Competition Policy Gender Module #6 ITU Workshops on Sustainability in Telecommunication Through Gender & Social. IMPACT ESTIMATION PROJECT h o r i z o n s c a n n i n g Anti-trust issues in on-line retailing Ed Smith Director Office of Fair Trading The views expressed. Exploring the Role of Legal Presumptions under the Convincing Evidence Standard in EC Merger Control Alexandr Svetlicinii European University Institute. Lectures on Competition Policy – State aid Louvain-La-Neuve 16 March European Commission, DG Competition State aid to network industries, liberalised. IMPACT ESTIMATION PROJECT h o r i z o n s c a n n i n g Observations on retail-MFNs and RPM Nelson Jung Director, Mergers Office of Fair Trading The views. 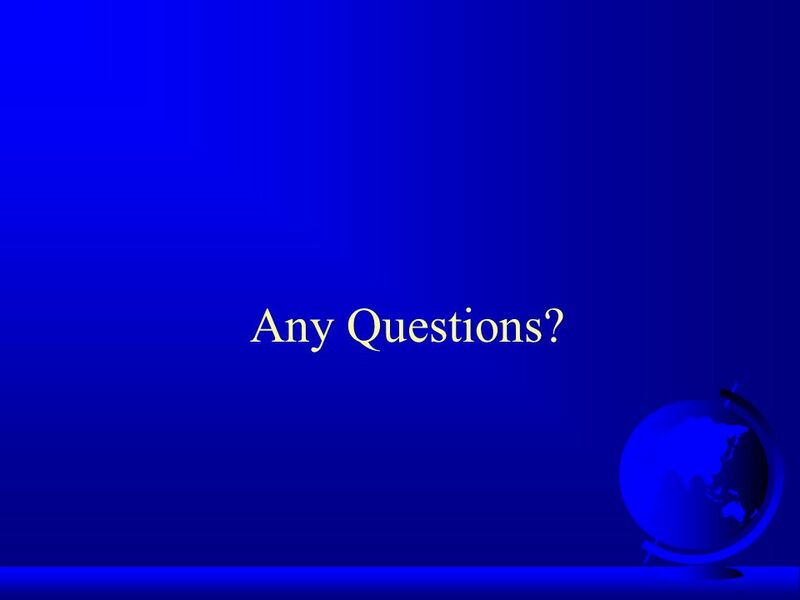  Past experience  SIEC test  Cases  Mergers in Times of Crisis  Conclusions. RESTRICITVE PRACTICES AND LENIENCY Zuzana Šimeková European Union – Opportunities and Challenges June 2009, Dubrovnik. Competition Policy and Consumer Protection Dr. Patrick Krauskopf Swiss Competition Commission (COMCO) National Training Workshop on Competition Policy. 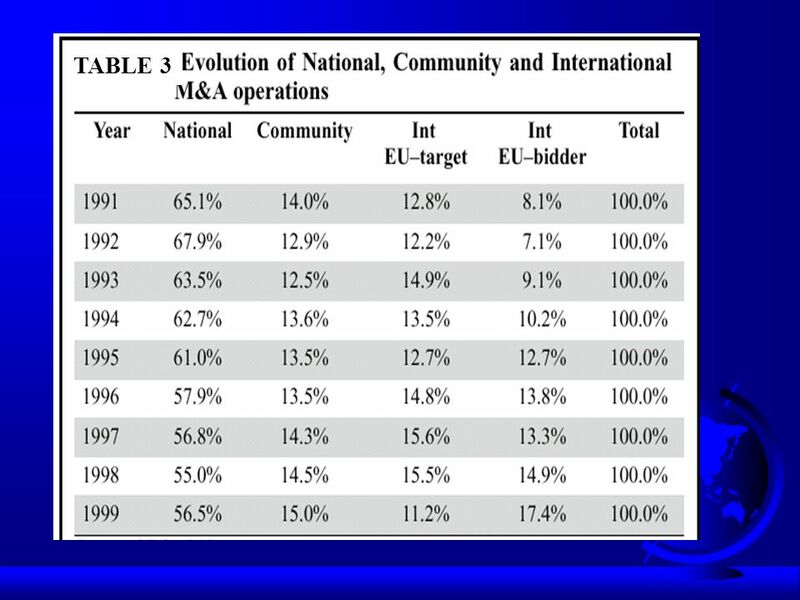 Administration in International Organizations PUBLIC COMPETITION LAW Class VI, 17th Nov 2014 Krzysztof Rokita. 5.1 Discuss the importance of defining a prospective business by writing a clear and concise business concept. Describe how a feasibility study can be. 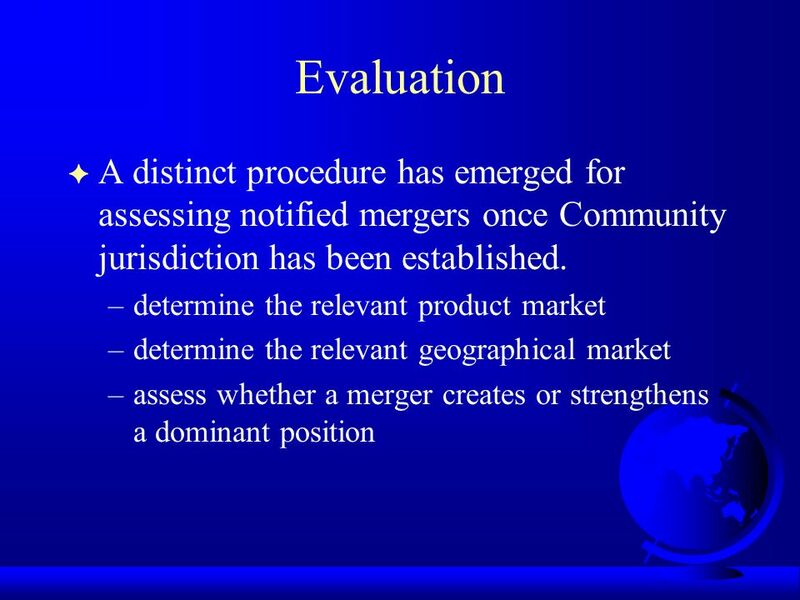 Procedure under the Merger Regulation. Procedure – legal documents The Merger Regulation Art. 4 – notification of concentration Art. 7 – suspension of. 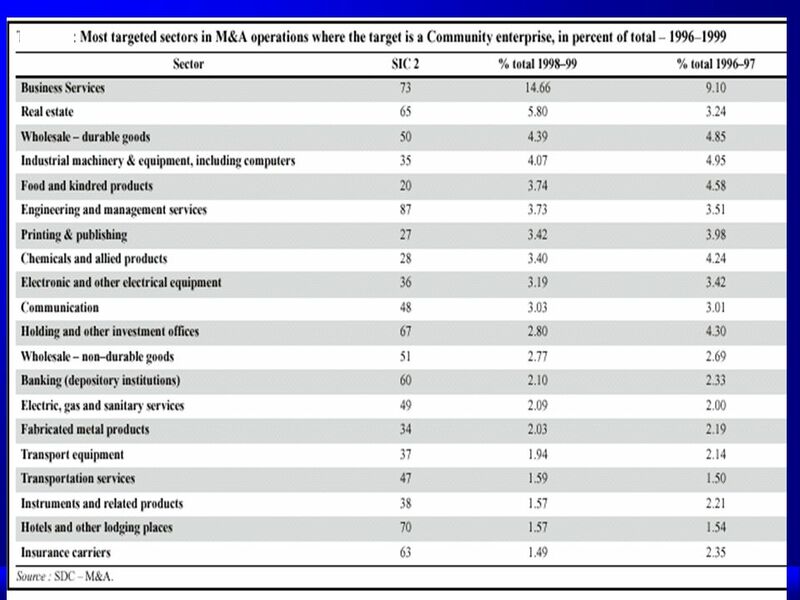 1 Pertemuan Kesepuluh Industry and Competition Analysis. 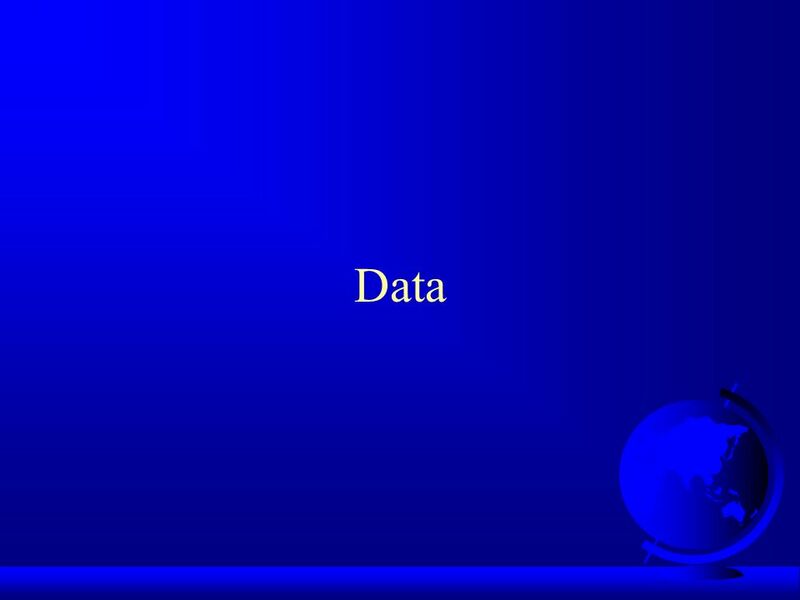 Welcome to Mergers and Acquisitions uk. 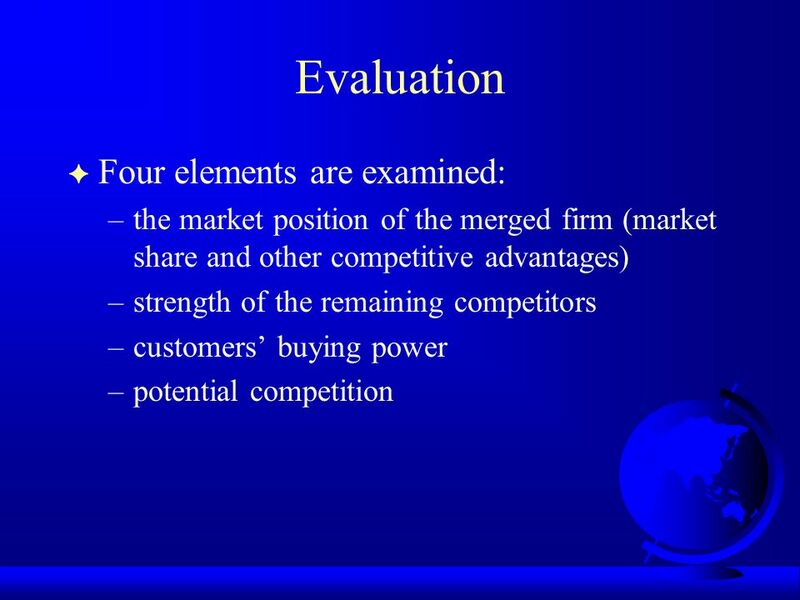 Plan of Topic Definitions Importance Patterns in Mergers and Acquisitions –Merger and Acquisition Activity in. Page 1 15th ITS World Conference September 2004 Dr. Jan Krancke T-Mobile International Who is afraid of Market Dynamics ? 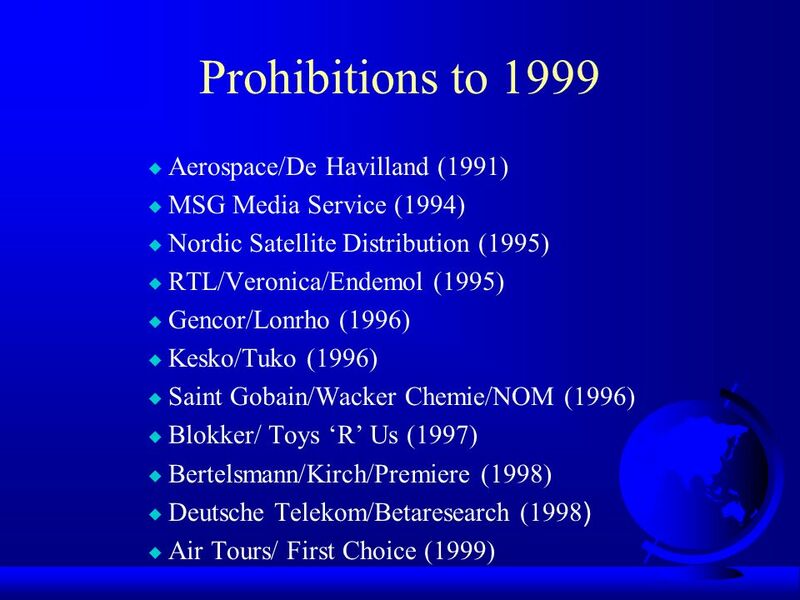 The Regulatory Leviathan. 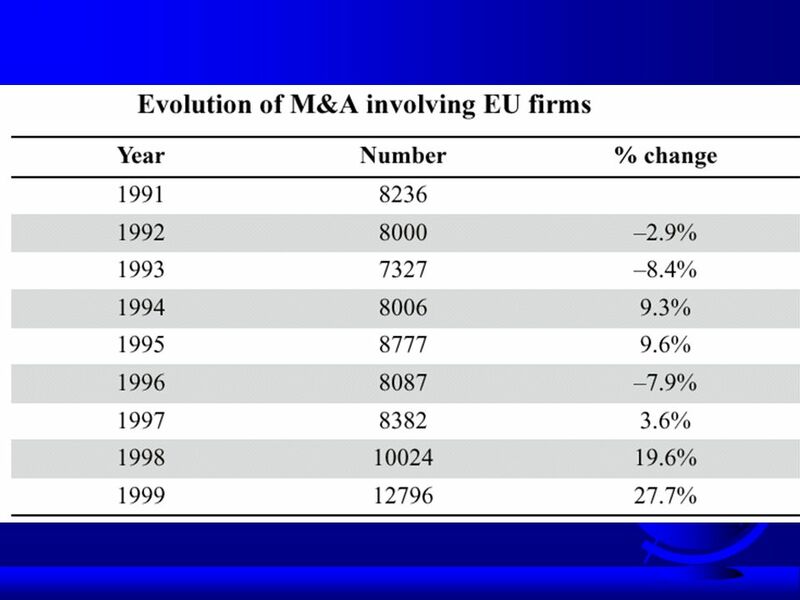 The US and EU competition policies: cooperate or compete? Alix Grassin Christin Fröhlich.